IP finance: Intellectual Property Law & Taxation: a new edition is coming! 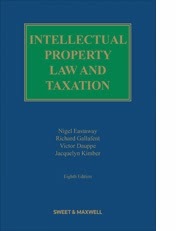 Intellectual Property Law & Taxation: a new edition is coming! A new edition of Intellectual Property Law & Taxation, by Nigel Eastaway, Richard Gallafent, Victor Dauppe and Jacquelyn Kimber is expected to be published on the last day of this month. You can get the full details from the publisher's website here. This book, now emerging in its 8th edition, covers the UK's taxation system as it affects patents, designs, trade marks and copyrights. While Europe's IP laws are increasingly harmonised, the tax regimes of the EU's 28 Member States are not, and offerings such as the 'patent box' give some jurisdictions an appeal that others lack. This blogger was just a young lecturer when the first edition was published. While he can't see he was particularly enlightened by the subject matter, tax never having been one of his strongest topics, he loved the examples and case histories that brought the volume to life. He wishes the new edition, which still has its original authors on board, the best of luck.